Great news: "Organ-isms: Anecdotes from the World of the King of Instruments" is once again available and updated after another reprinting. Go for it! ​NEW! Download MP3 tracks from "Resounding Aftershocks"
Just released CD "Resounding Aftershocks"
Martin Setchell's latest CD, released on March 6th 2019, celebrates the re-opening of the Rieger pipe organ in the Christchurch Town Hall, New Zealand. ​Read more, and order "Resounding Aftershocks"
Two FREE concerts on Wednesday, March 6th, 2019 marked the re-opening of the Rieger pipe organ in the Town Hall auditorium. The videos of the two concerts are available to watch from the Shipleys website here. Two capacity audiences and huge smiles and warm fuzzies everywhere. It was almost worth waiting the eight years for. 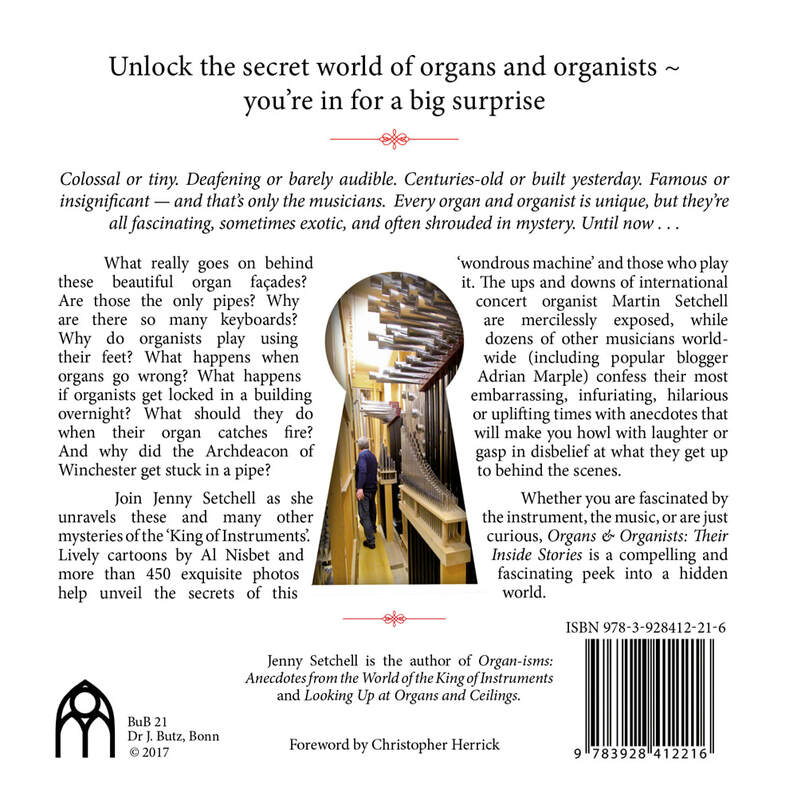 ​ "ORGANS AND ORGANISTS: THEIR INSIDE STORIES"
Back cover of "Organs and Organists: Their Inside Stories"
Calendars featuring photos of pipe organs from many countries around the world. Exploring a variety of fabulous instruments of different sizes, shapes, designs, ages, and the places they are found in diverse countries and cultures. Pipe organs - big, small, old, new, famous, or hidden treasures - they all make great subjects for photography. Jenny's photography site includes organs everywhere, from churches, cathedrals, and concert halls. It seems you can get almost anything now with an organ theme from this organ gift shop, and so here is the answer for the perfect gift for any organist friend, family member, spouse, child. Thousands of items here and many customisable!